4:00 am, the alarm rings. We leap from bed to shower to taxi to train to another train to monorail to plane. We land at Shirahama Airport at 8:55 am and then pile into the vans again. It is raining and will rain all day, so that means we have a free day. 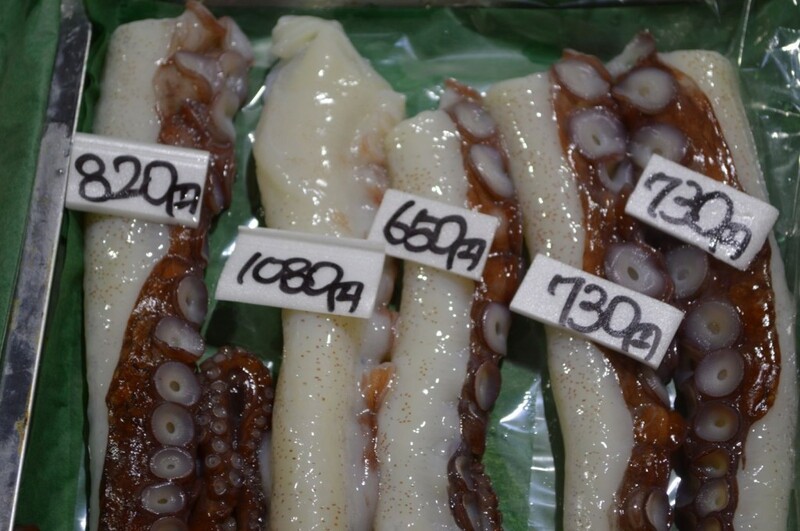 We drive to a large indoor market that sells fresh ocean produce of every shape and size. 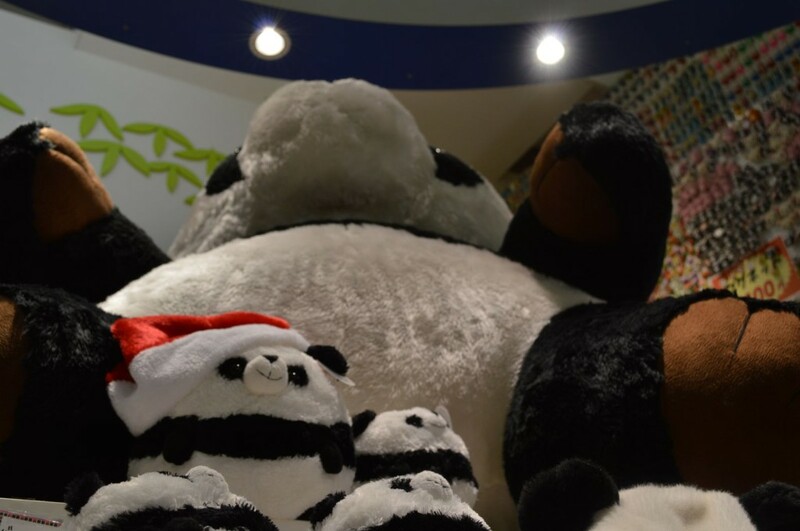 At the entrance sits an enormous panda stuffed animal. 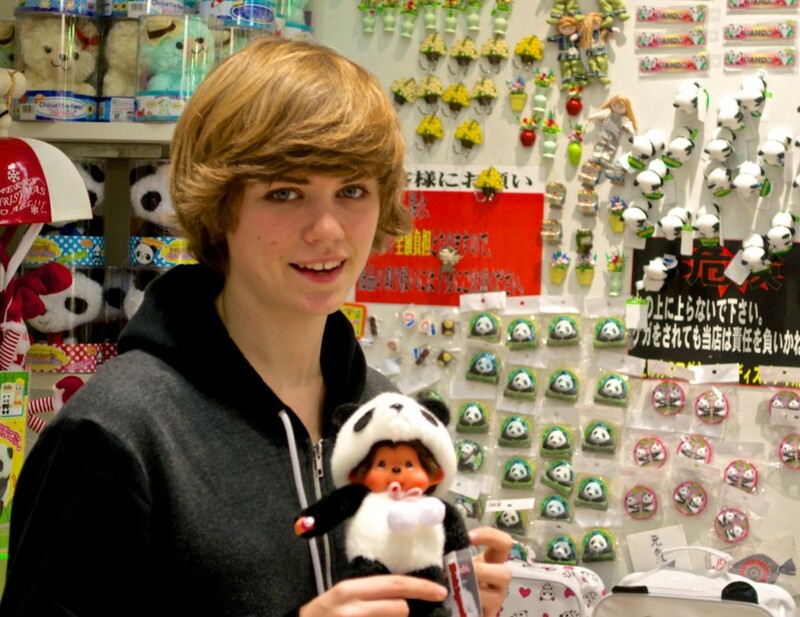 Panda related products are everywhere. As one souvenir T-shirt declares, “Shirahama is infested with pandas!” I haven’t seen any actual pandas yet but I have seen a true infestation of panda cookies, cakes, toys, key chains, dusters, hats, blankets and giant pillows. While the photo crew settles into a booth at Toretore Ichiba (http://www.toretore.com) to chat and smoke, I run around the market using my new Nikon D3200, (my first real camera ever!) 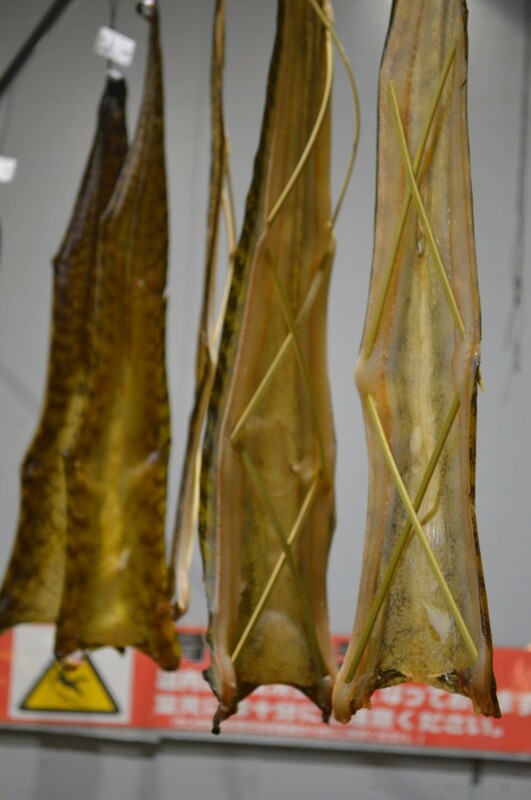 to practice by photography skills by taking photos of fish: dried fish, pickled fish, fresh fish, pressed fish and even stretched fish. 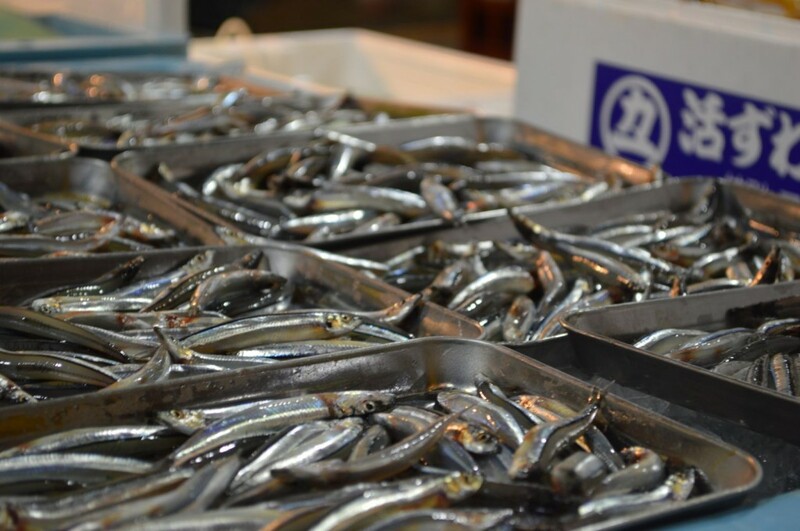 There are large tanks of swimming fish, tubs of squishy sea cucumbers and pools of lobsters and clams piled up on top of each other. 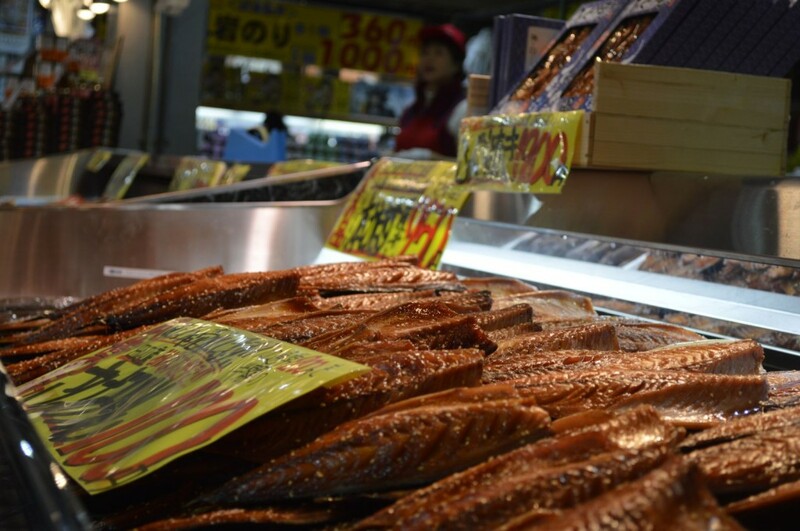 When the sushi bar at one end of the market opens, we all put in our orders and tuck into our tucker. 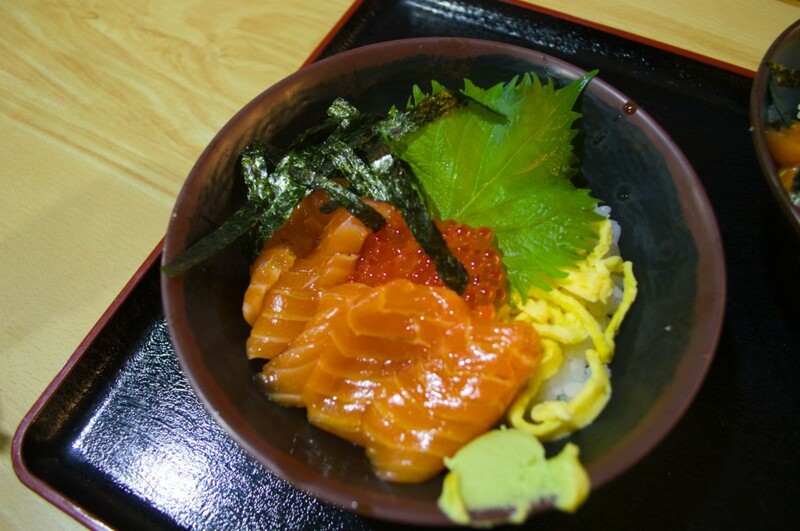 The salmon and salmon egg donburi are very fresh and absolutely delicious! We have to wait for an hour after our meal for our hotel rooms to become available so I write and Elsa plays a video game called, “Papers Please,” and pretends that she is an immigration official trying to support a revolution while staying alive. 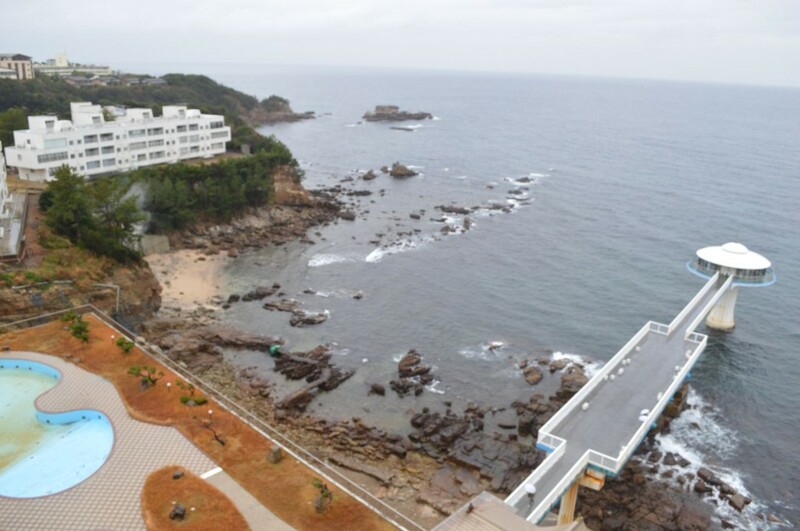 “Hotel Seamore” is our destination and it is indeed perched on the shore of the sea. The hotel is a bit old, but our corner room is spacious and lovely with an amazing view of the ocean from the large plate glass windows that wrap around the room. 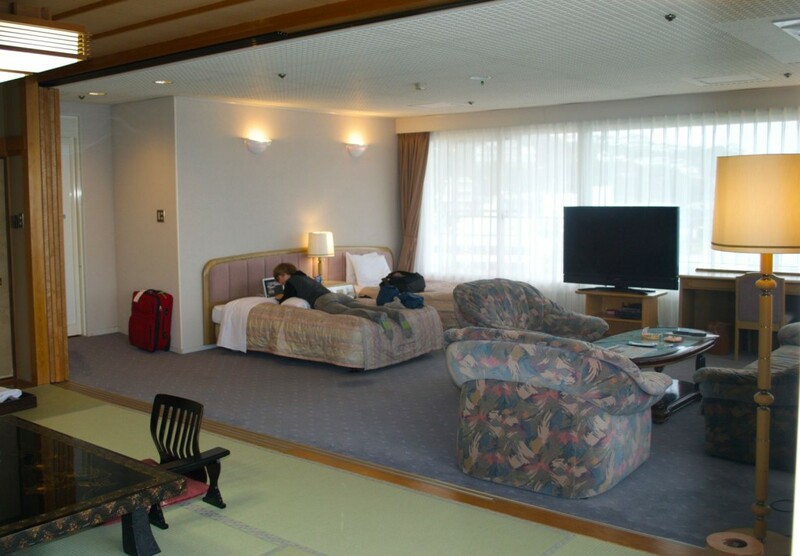 Room 615 is set up like a suite with a separate genkan and hallway leading to the bath, toilet and main room. The project writer who came up with the creative text on the JR posters is pictured above! 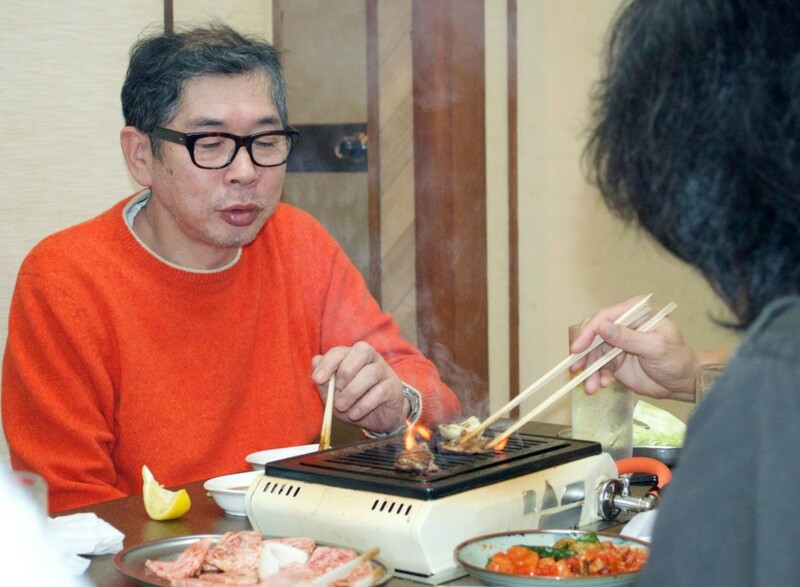 I wake up in time to join the crew at a yaki-niku restaurant where we grill tender slices of beef and vegetables over the fire in the middle of the table. We eat our fill and then head back to the hotel to catch up on email using the free Wi-Fi in the lobby. 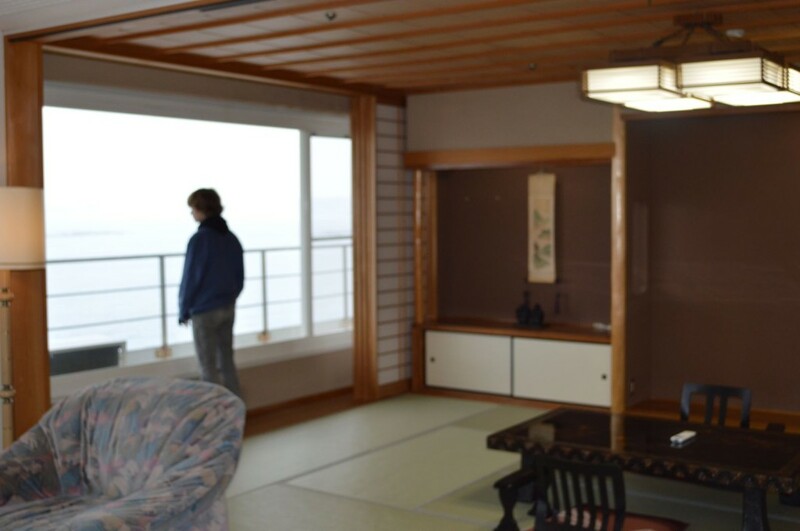 Finally, we head downstairs to enjoy the wonderful hotel onsen. 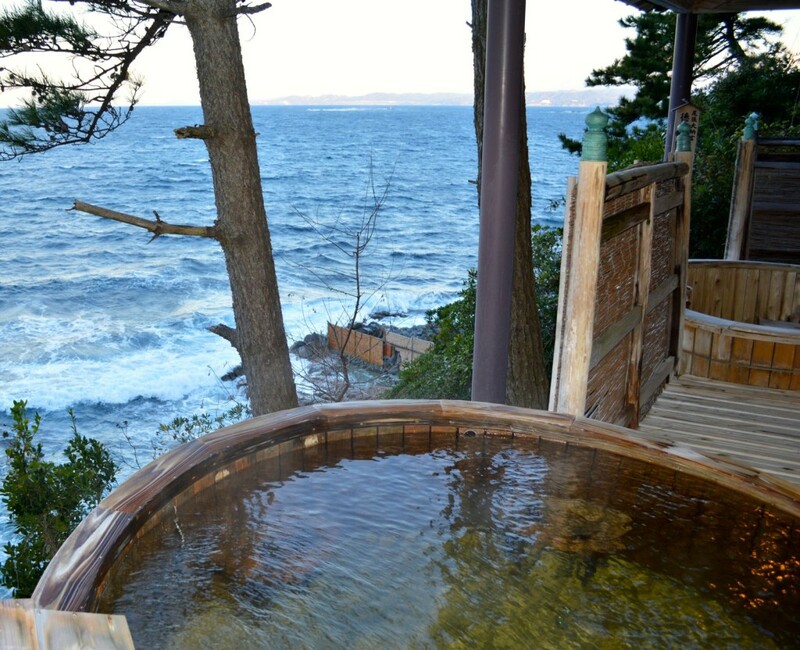 The outdoor tubs are especially lovely and we prop our elbows on the fresh smooth cedar and listen to the waves splashing on the rocks directly below. Down below on the shore, you can see the ancient rotenburo where the photos for the JR ad were taken. 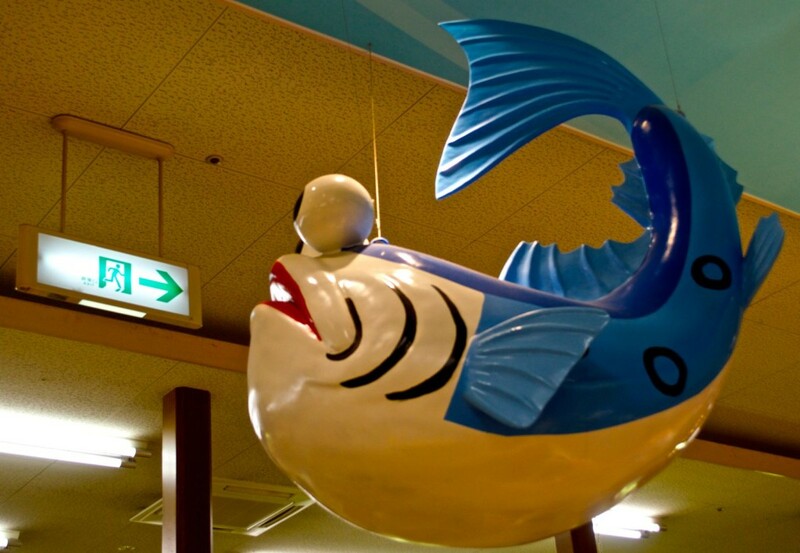 Tomorrow, we are off to “Kushi-Moto;” perhaps we will see the source of the dango on a stick! Makeup and hair call is not so early; Elsa goes first to get her hair trimmed. After our usual stop at the conbini for breakfast we have a long drive along the picturesque Highway 42 that winds along the coast. We stop at Hashikui (Bridge Pillar) near Kushimoto to take photos near the famous pillar rocks that jut up out of the sea; these volcanic batholiths which have emerged as the softer rock all around has been worn away over eons by the action of the waves. Along the shore, we find some lovely shells and a diminutive black crab speckled with little white spots who scurries across our hands as we admire its perfect little claws. The tide is coming in as we walk back and forth during the photo shoot. My shabby boots somehow hold together and my feet stay dry, while a wave sneaks into Elsa’s boots and soaks her socks. The play of wave against rock is spectacular and we try to capture the effect with the new camera. 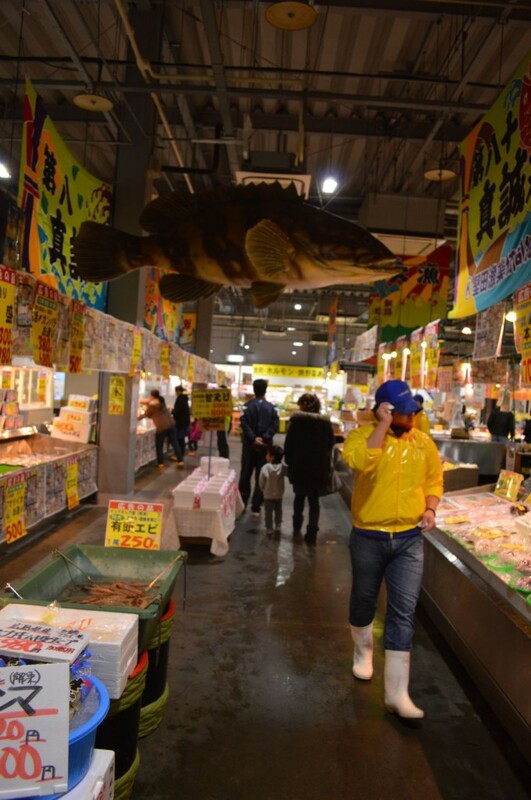 We have some time to shop for snacks and after finding some delicious dango or pounded riceballs on a stick, we wonder if Kushimoto might be the true source of the dango on a stick. (“Kushi” means stick and “moto” means source. Puns are fun and annoying in Japanese too.) Back into the vans as we climb and we drive back towards the hotel where we hope to shoot photos at the hot spring by the ocean… but it is starting to rain. 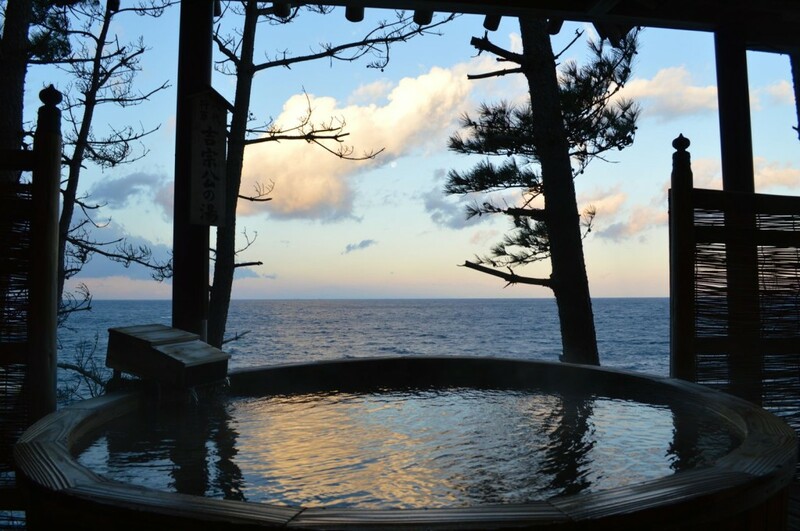 We may have to delay the rotenburo (outdoor hot spring) shoot until tomorrow. Nope… looks like we’re going in. We are kindly given skin-colored shorts and body socks so even though in the pictures, we will look like naked bathers, we are actually well-covered. 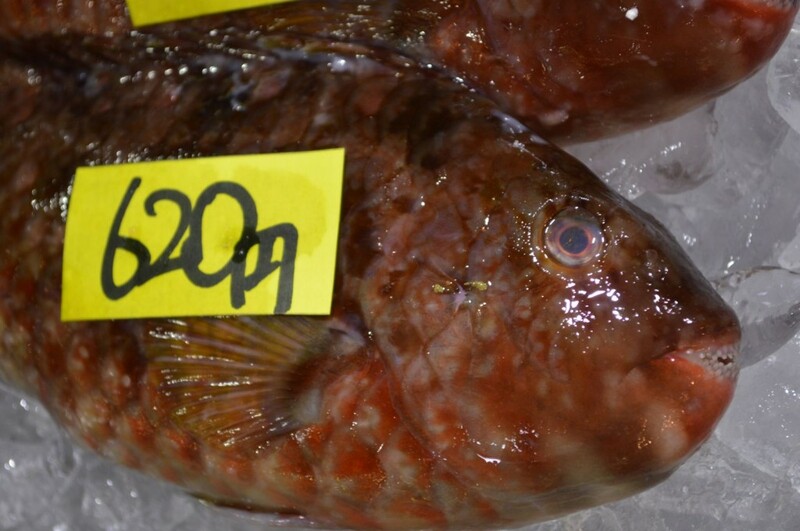 Very polite of them, but it does feel strange to be soaking in a rotenburo with clinging wet clothing. 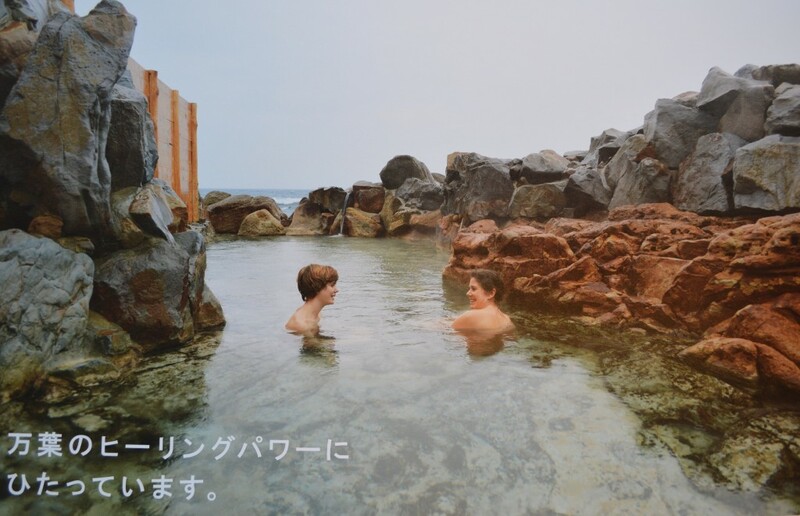 Sakino-Yu Hot Springs is an ancient pool carved out of the solid rock by the waves. As you step into the pool, you notice cool spots but the water is comfortably warm. If you are brave enough, you could crawl out over the low rocks at the end of the bath and plop directly into the chilly waves. We did not try this. A chill rain is falling so after exiting the water, we quickly wrap ourselves in towels, yukata and coats. 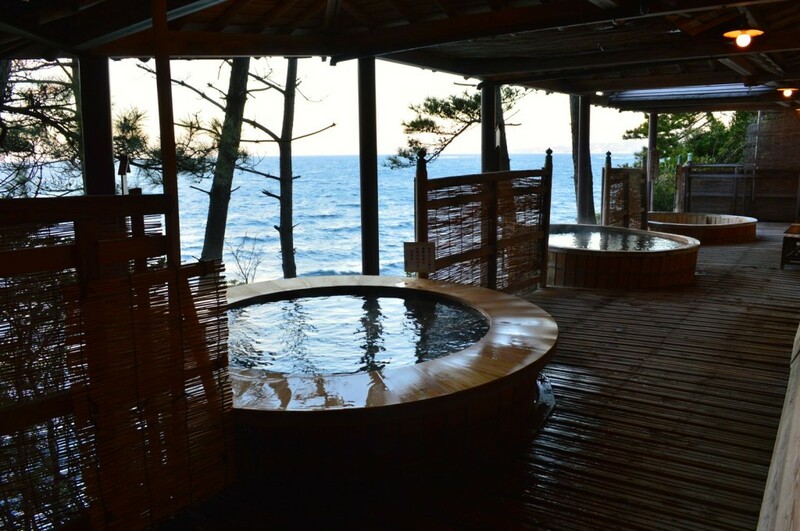 We hurry back up the hill to Hotel Seamore and ease into the hot baths there. The steam room helps my throat feel better. At 4:53 pm, we are back in our room watching as the sun drops below the horizon glowing cherry red. Wow. A sore throat kept me up until about 1:00 am, but I finally got some sleep with hot packs wrapped around my neck and a wet face mask across my nose and mouth. We have to be down at the front desk by 7:30 am, so we hurry to pack and meet the crew in time. I dash down to the outdoor cedar tubs to take photos before we leave and then we are off to “Adventure Land” to see the pandas. When we arrive, it is quite chilly and we wait for the pandas to be released into the outdoor pen for their morning bamboo breakfast. We stop to admire and coo over a beautiful female panda who is enjoying a morning stretch at the indoor viewing pen. She is so perfectly adorable that she hardly seems real. Back out into the cold we go to set up for the panda shots. The two older male pandas are released into the outdoor enclosure and they happily begin to munch the pile of fresh bamboo that has been left for them. I am amazed at how they can nonchalantly chomp through tough stalks of bamboo. They strike an artistic pose, sitting on their wide, carpet-like tails as they chew their bamboo stalks looking for all the world like two furry tuxedo-clad flautists playing a duet. Towards the end of the photo session, the weather continues to confound us by dropping light sheets of hail which shows up bright and white against the black, dense panda fur. We pack up and make our exit as the skies clear and the crowds begin to pour into the park. On our way to the next shooting location, we stop for a hot lunch of delicious ramen and while we are eating, it begins to snow. The weather continues its strange pattern as we drive and the snow begins to accumulate on the trees alongside the road. The photos that we are taking today are supposed to be set in October, so our clothing reflects much warmer weather than we are actually experiencing here in the middle of December. I wear three kairo (chemical warming) patches on my back in order to stay warm during the photo sessions as we try to pretend that the weather is warm. As soon as the cast is assembled, we trot across the street and get into position for the next scene. The “extras” assemble in the hot water in varying states of attire, from single towel to yukata wrap and proceed to thoroughly enjoy themselves as they cluster towards the warmest part of the rotenburo near a cleft in the rock at the side of the river. Tonight we are back in the hotel “Shingu Ui” (http://ui-hotel.co.jp) (where we stayed in October) and it is within a short drive of Koyamasan. The rooms are clean and comfortable and, as always, it feels luxurious for me to be sleeping in a bed instead of on a tatami mat floor at home. The cold wind whistles outside as I burrow under a soft down comforter. 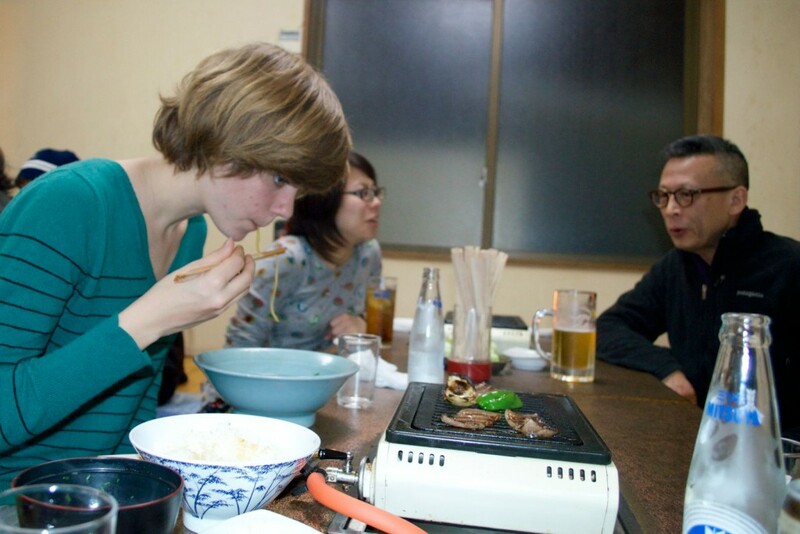 The rest of the crew have gone out to eat at ”ポポット” (23-0417) which is a small and homey restaurant that serves lovely little pizzas and wonderfully tender beef. I am content to stay put in my cozy bed and get over my sore throat. Saturday begins with a 6:30 hair and makeup call. It has been snowing outside in the early morning, but now the weather clears. A strong wind blows all the clouds away and we have the sunniest day so far. And because of the strong wind, my hair is sticky and hard with hair gel to keep it in place for the photos. Elsa and I get to the lobby early this time, only to scurry back to our rooms to finish packing when we suddenly learn that we are not staying in this same hotel another night. Our first stop in Hayatama Taisha which is a famous shrine on top of a steep hill. http://www.tb-kumano.jp/en/world-heritage/kumano-hayatama-taisha/ The stone steps leading up are steep but the route up is not very long. 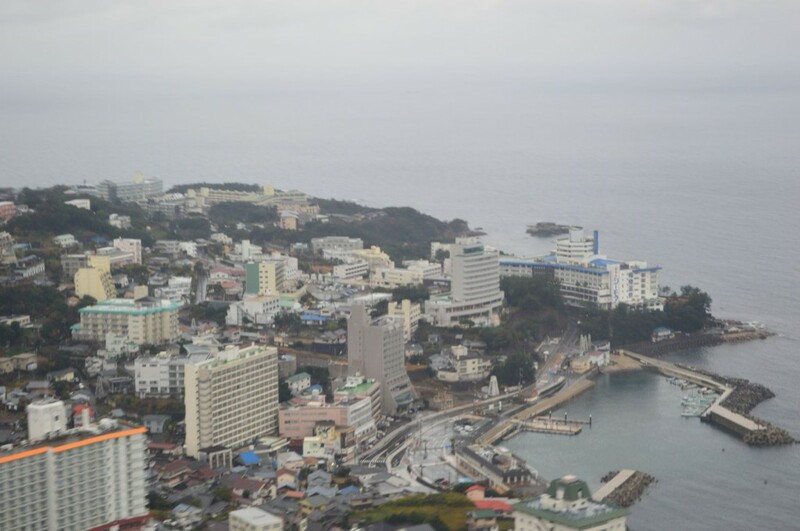 We soon reach the top and enjoy the view looking out over the city of Shingu to the ocean beyond. The brightly painted shrine is perched on the tippy-top of the hill next to an impressively large round boulder. The rock has been wrapped all the way around with a thick rice straw rope which will be replaced every year in February during the festival of Setsubun. After the photo shots by this hilltop temple, we trundle back down the hill. I run ahead to get photos of the hard-working crew coming down the steep steps. I still have only learned a small portion of my camera’s capabilities but I am learning as I go. I am impressed with our van drivers who show great skill, navigating our wide vans through some of the narrowest streets I’ve seen without so much as a scratch. 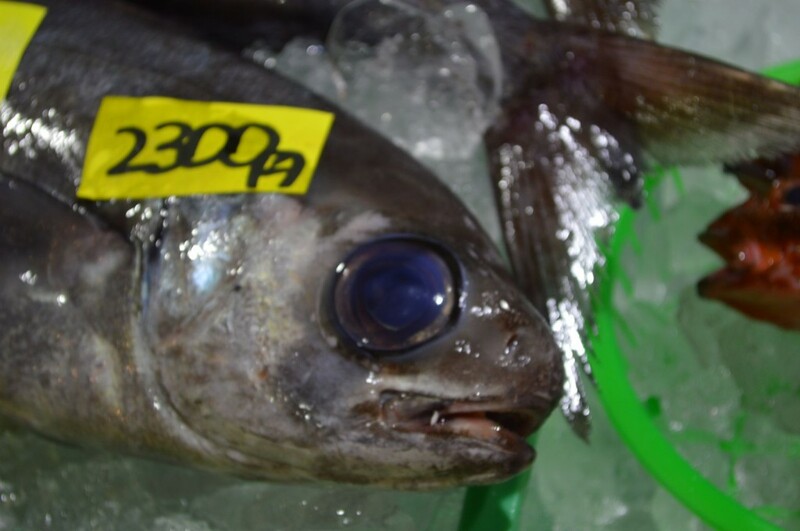 During the evening meals, they never drink alcohol and are very conscious of safety issues. Every morning when we get into the vans, they are spotlessly clean with the seat belts neatly rolled up in place on the seats. Next, we drive along the Kumanogawa, a beautiful wide river with gravel banks that flows from the slopes of Daifugen-dake to the Pacific Ocean at Shingu. Here is a link showing the location of the river’s source: (http://www.openstreetmap.org/way/59241810#map=14/34.2100/135.9343) Kumano has the kanji for “bear” in it, so it roughly translates as “Bear River.” The bears are all hiding now, though, perhaps waiting for more fish to return to the river. In places, the river is a brilliant aqua color and in other areas, sediment muddies the river to a light brown. The views along the Kumanogawa are breathtaking with an occasional sheer cliff or waterfall surprising us as we drive along. Route 168 follows the river for much of its route. After a blustery shoot in a very strong wind along the gravel banks of the Kumagawa, we head back into town along Highway 168 to take pictures at Hongu Taisha, another World Heritage Site in Shingu. http://www.tb-kumano.jp/en/world-heritage/kumano-hongu-taisha/ This shrine is close to the road with easier access. Here, painted pictures of various animals have been set up in preparation for New Year’s Day. We take photos in a location that does not show the pictures as the shots are supposed to be set in October or November, not the end of December. Taisha means “main shrine” and indicates that Hongu Taisha is a major Shinto shrine. Here, as in other shrines, paper fortunes are offered for sale. Visitors will often purchase a fortune and then fold the paper lengthwise and tightly tie it to a branch of one of the temple trees. In many of the Taisha there are often bells placed in gateways leading to the temple. A pilgrim will bow respectfully, step up to the bell, give it a shake and then clap twice to get the attention of the shrine god before making a wish. This shrine uses the sacred three-legged crow motif in various locations. There is a striking example perched on top of the shrine’s mailbox. Here we wait for the sun and set up some shots in front of a couple of giant bells with their thick rice straw bell pulls. The sun breaks through the clouds and we scurry to get the needed photos. The director is pleased with the results and often takes time to show us his work. As we pack up to leave, the crowds arrive. Boxed lunches (obento) are waiting for us and we eat as we begin the two-hour drive to the next location, one more attempt to get some good photos at Hashikui, the rock pillars jutting out of the ocean. We wind along the coastal road and on the way we see a shipwrecked tugboat leaning into a pile of sharp rocks. This time, when we reach Hashikui, the tide is low, and we can walk out towards the rocks without getting doused by the waves. The blue sky is spotted with fluffy white clouds providing a perfect backdrop to the dark, looming rocks. Arai-san, the hair stylist, finds a couple of impossibly tiny crabs about the size of ladybugs. Elsa and I walk back and forth as they shoot photos from the edge of the highway above while another crew member holds back a large clump of sea grass to clear the view. And then we are done for the day. Elsa finds some of the best fried potatoes ever and shares them around as we drive back towards Shirahama where we stay at the Hotel Ginsui which means “Silver Waters.” As we drive, the sun sets in a glorious display of back-lit clouds over the ocean. I am desperate to get a photo of the stunning scene, but I have to shoot through the glass of the van window as we cannot stop for photos. The vibration reduction feature on this Nikon camera succeeds in giving me a few usable shots. 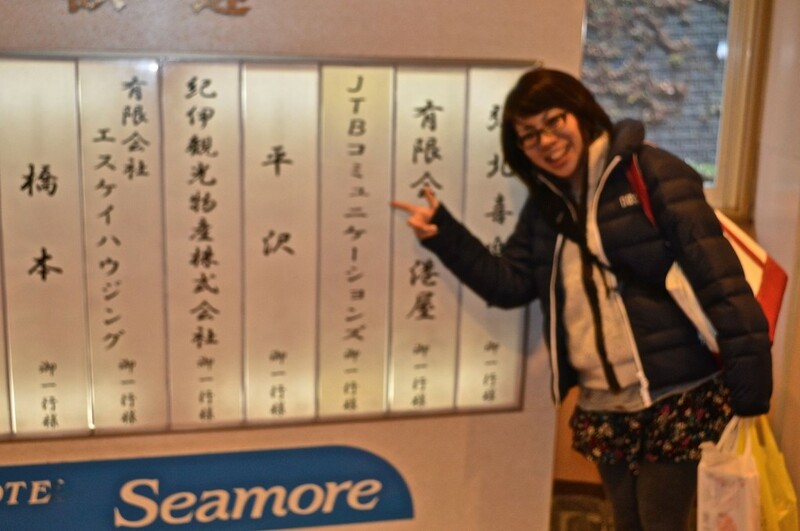 Tonight is the last night out together and we are treated to a wonderful meal of sashimi and various seafood at Marucho restaurant in Shirahama, which has private tatami rooms. I am puzzled by a tall machine with a screen perched in the corner until I realize that it is a portable karaoke machines. Thankfully, we don’t make use of it. 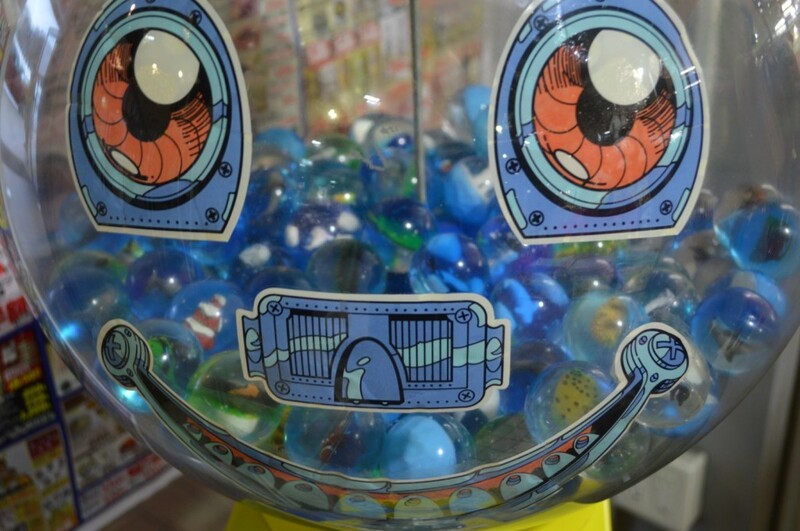 The front lobby of the restaurant is a little “store” area set up just for children where they can fill a bag with an assortment of treats and prizes. We stop to try on the panda and the squid hats. I mean who could resist a squid hat? Elsa is not feeling well, so she stays in her hotel room and sleeps. We bring her back some miso and a but of supper, but she just wants to sleep. I hope she feels better in the morning. The day dawns bright and pearly with poofy clouds scudding across the sky; a perfect day for taking more panda pictures. This will be our last photo session. We arrive at Adventure Land well before it opens and the parking attendants with the fuzzy panda hats perched on their head let us in the back gate. We wipe our feet off on the disinfecting pads and enter the park. The cameras are set up and the scene is set but we have to wait for the sun. As soon as the cloud bank moves aside, the door to the panda enclosure opens and the pandas saunter leisurely over to the strategically placed pile of fresh bamboo. The two male pandas settle down on their comfy carpet-tails and proceed to munch contentedly on bunches of bamboo leaves. They are unbelievably adorable with their thick fur and handsome black ears. It’s hard to believe that such creatures exist, they are so perfect. The clouds cooperate this time, moving aside to provide light-saturated shots of admiring visitors and blissful pandas. As soon as the cameras are put away, the pandas, as if they know their work here is done, get up and waddle off. The vans are packed up and we head back to ToreTore Ichiba for a celebratory toast with pink champagne in plastic cups. 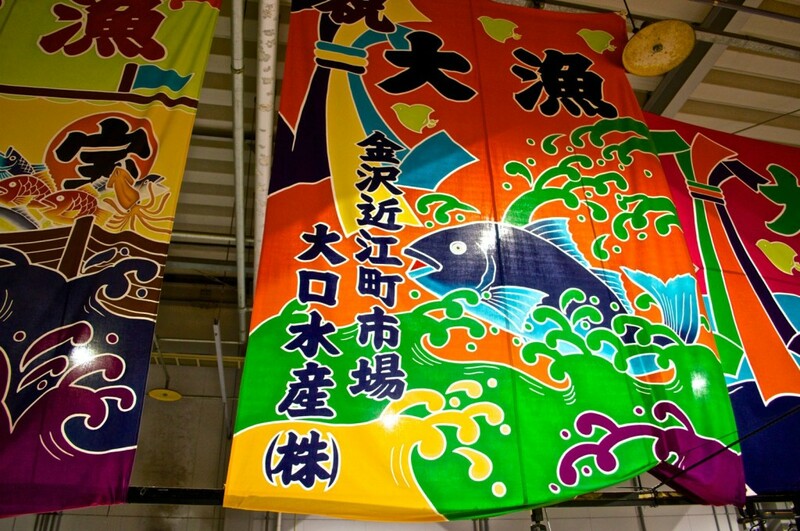 We assemble in front of the big fishy sign for a few “kinen shashin” or group pictures. Back into the vans and off towards Kyoto we go to catch the Shinkansen back to Tokyo. We should arrive home about 4 or 5 in the evening. It has been a wonderful paid, paid vacation. Elsa and I are still surprised that we are getting paid to see such a beautiful part of Japan. We kept half-expecting them to just send us home as soon as they realized how little work we were doing. All that was required of us was to get up early, get dressed in borrowed clothing, and then stand around in front of beautiful locations and smile. “How is this work?” we wondered. We appreciated the hard-working crew keeping us around for so long, in any case, and we are heading back to Tokyo with a camera full of photos and a heart full of memories. Domo arigatou gozaimasu! 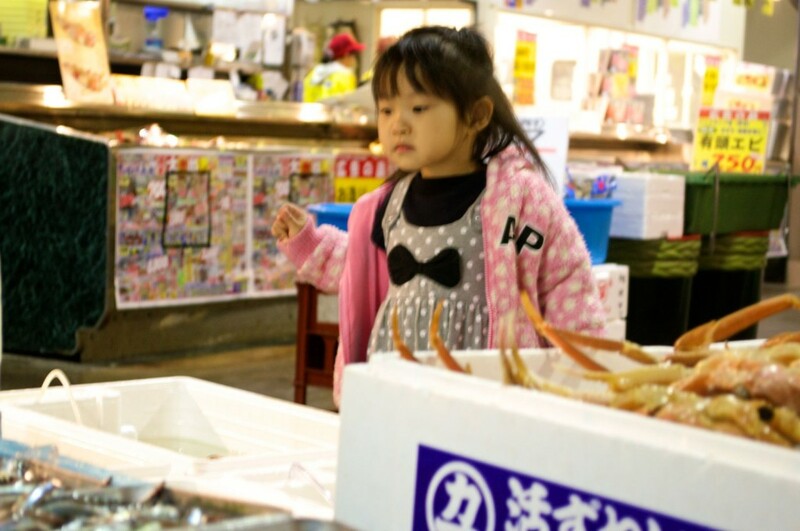 This entry was posted in Uncategorized and tagged Japan, JR, JR Wakayama, model, modeling, transmedia storytelling, UNESCO, wakayama, world heritage sites, World Wide Wakayama, Worldwide Wakayama by ruth. Bookmark the permalink.